Demir Kapija (Macedonian: ) is a town in the Republic of Macedonia, located near the ominous limestone gates of the same name. It has 3,725 inhabitants. 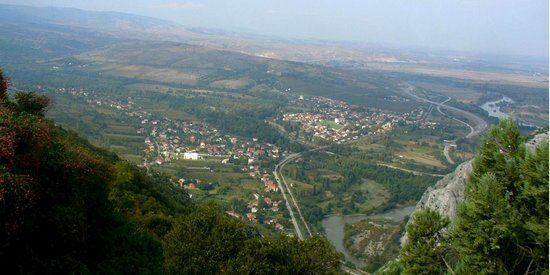 The town is the seat of Demir Kapija Municipality. The Vardar river makes a wonderful gorge close to Demir Kapija, while the "Bela Voda" cave is very interesting to see at 955 m long. When passing "The Iron Gates", the road leads to the Valandovo and Gevgelija valley. It is the most picturesque region in Macedonia, as well as the most varied with its agricultural products. 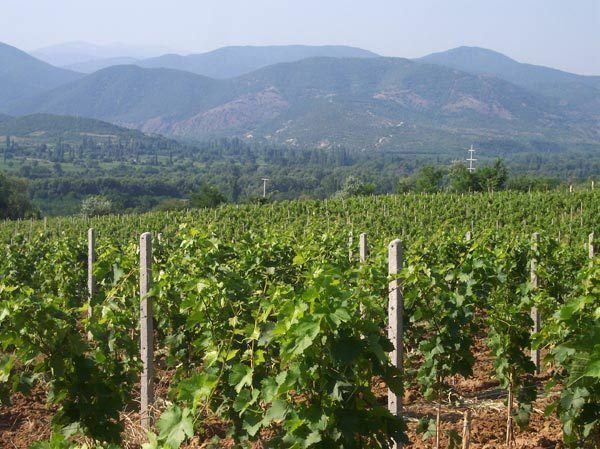 This valley is under the influence of the Aegean climate. Demir Kapija has recorded the highest temperature in whole Macedonia. 45,7 degrees Celsius was recorded here the 24 of July 2007. It is also a national monument of nature and an ornithological reserve, home to many rare species of birds and endemic plants. Demir-Kapija is a place already mentioned in Classical times under the name of Stenae (Greek for gorge). Even earlier dates to the Paeonian era, a fortress for which remains on the mountain Ramniste on the foothills of the Demir Kapija settlement. The ruins are one of only 3 known Paeonian structures in Macedonia unearthed, and dating some 3000 years. In the Middle Ages Demir Kapija was known as a Slav settlement, under the name of Prosek, while todays name originates from the Turkish reign, meaning "The Iron Gate". The town of Prosek was used as a fortress due to its good strategic position; history and artifacts suggest this fortress was built in the era of the Macedonian dynasty around 450 BC as a look out to the canyon beyond for troop movements to the north. In the thirteenth century AD, Prosek had become the seat of Dobromir Hriz, and Strez was its well-known commander. The former settlement was fortified by walls, and it is considered that it was used to exist in the Neolithic Age. Demir Kapija is hiding numerous localities and invincible remains. The research up to the present has proved that all the pass periods have left their traces: the Paeonian, Ancient Macedonian, Roman, Byzantine, the period of Samuil the Turkish as well as the early Christian period. The former Yugoslavic King Aleksandar Karadjordjevic had his summer home and winery built here. The winery is the oldest on the Balkans and still produces quality wines under the privately owned Agropin name. Newer wineries, like Popova Kula, have opened up additionally and paves the way for exports and economic stimulus of the region. Demir Kapija is also home to the flour mill Dekamel and has a modern farm for production of eggs known as Salmak.